1. My girls hate onions. there was 1 muffin left. I told them it was a onion muffin so I could eat it all to myself. 2. I ate my son’s last curly wurly the other day and told him it had melted so I had to bin it. 3. I hide ben and jerry’s ice cream inside a frozen pea bag so I don’t have to share with kids!! 4. I put my daughter to bed and persuaded my husband that it had taken me 2hrs to settle her and that’s why he had to do all the housework by himself… infact id been sat in the hallway, whilst she was asleep (had taken 10mins to get her down) watching Netflix on my tablet just so I could have some peace. 5. My daughter is at nursery until 3.30pm each day… I will not pick her up any earlier than 3.29pm so I can enjoy the 30mins of peace after I’ve finished work… in this time I will have something to eat (so I don’t have to share) and go and sit on the loo for at least 10mins so I can have a wee in peace… I sometimes feel bad because she’s always the last one picked up but I need at least one pee a day to myself! 6. I hid a bag of liquorice behind the sofa cushions after my toddler saw and made a beeline for them… This mummy doesn’t share! 7. I tell my daughter that mummy has a poorly tummy just so I can sit on the toilet in peace and play games on my phone. 8. When I’ve had a day of no housework, I tell my partner that I’ve had a really tough day with my son so he doesn’t complain about me doing nothing and does it for me. 9. Every day, after my daughter has gone to nursery, I tell my partner I’m going to the gym but actually go to Costa for a hot cup of coffee and then just get changed into my gym clothes before I see him after nursery.This mumma needs some alone time too! 10. I tell my 3 year old that she has to be 4 sometimes to do things, or that if I’m eating something nice she would find it too spicy. 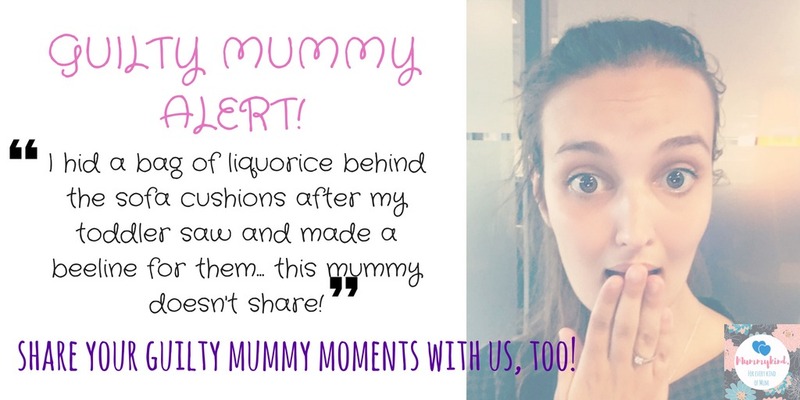 We’d love to know your best ‘Guilty Mummy Moments’, no matter how sneaky or cheeky they may be!! LOL, why do most of these center around food? There were times I tried to hide a treat from them but then I felt guilty and had to give them some too. Then when I changed my diet to Ketogenics and started making sugar-free desserts, they suddenly don't want to share with me anymore. My daughter has recently started watching me do a wee and then congratulating me when I finish, clapping her hands and saying well done mummy… As sweet as it is, I'd rather wee alone I think! My daughter always conveniently needs a wee at the same time as me, so she parks her potty next to the toilet and we were together! A wee in peace would be lovely though! Thank you Nicole! Glad it got you giggling! These are great! I don't feel so bad now when I make an excuse. Yesterday I kicked the other half out of bed when he was having a lie in because our daughter was being a terror all morning. I sat in bed with a cuppa and the TV on and took my sweet time. It was lovely. Previous Post What is there for toddlers at LEGOLAND Windsor Resort?